The 10 Best Pizza Restaurants in Iowa! Let’s face it: Pizza is great for every occasion. The state of Iowa knows it, and throughout the metros and beyond you can find handcrafted, fresh-ingredient inspired works of pizza art that define the very best of pizza restaurants in the nation. To check out some of the best slices you’ll ever sink your teeth into, be sure to check out these 10 best pizza restaurants in Iowa. Often noted as some of the best slices in the state of Iowa, the Chicago-style pizzas of Wig & Pen delivers with every bite that pizza expectation you deserve. With three locations spread out between Iowa City, Coralville and Des Moines, while ordering online or for takeout will deliver this pizza you should crave, to really get the full experience, it’s worth taking a seat in the fun-filled and pub inspired decor in any three of the Wig & Pen locations. Fong’s Pizza is a staple establishment on the downtown Des Moines scene, and with a recent expansion into Ankeny, there’s more than one place to get this unique pizza made to order. Whether you go for a Fong’s classic like crab Rangoon pizza or you pick up one of the many different kinds of individual slices sold daily, you’ll be sure to enjoy not only the freshly prepared food made for you, but the renovated interior of the Chinese restaurant that Fong’s fills in with their uniquely inspired tastes. You just can’t argue with pizza done right, and at Zipp’s Pizzaria in Adair that’s all they know how to do. In operation since 2012, Zipp’s Pizzaria is open during the evening hours to cater towards or deliver a great supper, and while all their pizza is worth mentioning, it seems that their hand-crafted taco pizza is giving them the most notoriety. Check out all the unique flavors and toppings yourself, or go for an old favorite, whatever you decide to order, be prepared to have your appetite well satisfied. Established in 1952, Zeno’s Pizza in Marshalltown has been using fresh ingredients to handcraft their pizzas for over 60 years, and while the world has changed a lot throughout all that dough spinning, Zeno’s has always remained a favorite. While it’s the fresh ingredients and handmade mentality of Zeno’s that has kept them in business for so long, it’s the Marshalltown community and people that fill the seats that make this a true pizza staple in the state of Iowa. Operating since 1959, Jerry’s Pizza in Sioux City has been stacking fresh ingredients on handmade pizzas for nearly 60 years now, and by the way it has made itself a staple in the Sioux City community, it doesn’t look like it’s going anywhere else soon. It’s the family-owned recipe that has kept Jerry’s in business so long, and the attention to detail that goes into every slice, and it’s the final product of taste bud enticing bites that keep customers coming through the door at Jerry’s Pizza. If you’re around the Iowa City area, the word Pagliai’s (pronounced polly-eyes) is synonymous with pizza. That’s because Pagliai’s Pizza on East Bloomington has been setting the pizza bar high in the area for over a half-century. The renowned success of Pagliai’s Pizza comes from the family recipe the restaurant still uses today that dates to Northern Italy in the early 1900s. This authentic taste never gets outdated though, and within your first bite of Pagliai’s you’ll know it won’t be your last. If you ever attended Luther College for a degree or even a day-visit, chances are you already know about Mabe’s Pizza on East Water Street, that’s because the college and the pizza joint go hand-in-hand, and it was originally a Luther College student that baked the first pizza in what was once Mabe’s Lunchroom, thus causing a menu revolution and leading to the evolution of Mabe’s Pizza. Check out this college-community staple for yourself, and see why Mabe’s Pizza has remained as such for over 60 years. There is a direct correlation between quality pizza restaurants and college campuses, and for Iowa State University in Ames, their connection to great pizza can be found at The Great Plains Sauce & Dough Company on Main Street. Serving up high-quality ingredients since 1979, The Great Plains Sauce & Dough Company is about as local as it gets, and it isn’t false advertising that has ensured their success over the years, it’s the high attention to detail when it comes to quality ingredients and craftsmanship that separates Great Plains from the rest. Known simply as P’s in the Le Mars community, this once pizza-only joint has evolved over the years alongside their menu to offer pizza, pasta, steaks, burgers, brews and much more. While this means if your appetite changes when you walk in the door of P’s Pizza House, you won’t be discouraged by changing your mind, but if it is pizza you’re looking for, P’s still delivers on what originally made this progressive pizza house what it is now, high-quality pizza with fresh toppings to choose from. 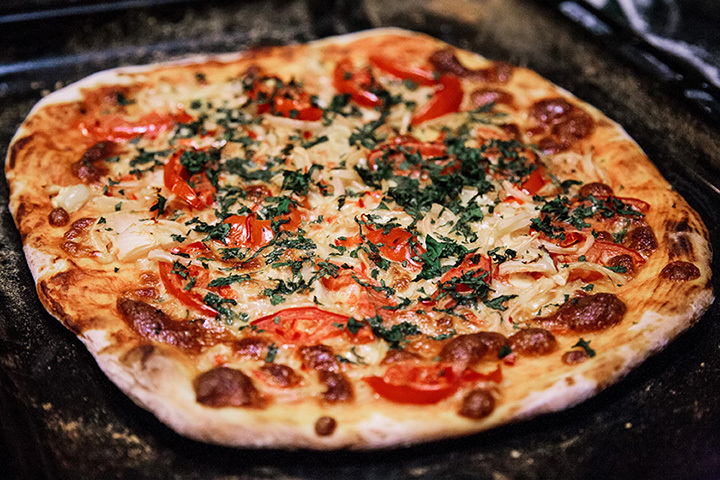 With two convenient locations in Des Moines and West Des Moines, the Tavern Pizza embodies what a pizza restaurant should be, and you can smell it the moment you walk in the door. The Tavern offers all sorts of Italian fare including pasta and lasagna that’s worth the trip, but you can’t leave The Tavern without at least trying some of their mouth-watering pizza options. Whether it’s a Chicago-style deep dish or a classic thin-crust pizza, you won’t be disappointed with your pizza from The Tavern until there is no more left of it to eat.